In an interview with Michał Mackiewicz, the Chairman of the Association of Poles in Lithuania (ZPL) and a member of the Seimas of the Republic of Lithuania as a representative of the Electoral Action of Poles in Lithuania (AWPL), we talk about the reasons why a Polish school might be the best option for Polish children in Lithuania; the strong women promoting passion for the Polish language and national culture in those places in Lithuania where Poles do not constitute a numerous group; and the Poles’ love of that country, although it is often not a mother for them, but a stepmother. L24: How do you assess the conditions in which Polish educational institutions have to function in Lithuania, a country where Poles are a national minority? Michał Mackiewicz: For Poles this issue is obvious, talked over, and analysed in all respects. But what matters here is that it should be equally obvious for the government and Ministry of Education in our country. It’s about highlighting that national minorities are a treasure of Lithuania, one which should be protected and cared for. By the depletion of possessions of the Polish community in Lithuania, this whole country – not only Poles – is robbed. The assimilation policy towards Poles is often described by using a beautiful word, “integration”. Such a view of integration, with the main idea being to hasten their disappearance from those territories, is doing great harm to the whole of Lithuania. Now is the time to draw attention to this. L24: You’ve been the head of the Association of Poles in Lithuania for years. This organization, the biggest Polish organization in Lithuania, supports and founds Sunday schools in which the Polish language is taught; and it collaborates with them. How does ZPL support the Polish educational institutions in Lithuania? How does its collaboration with schools proceed? Michał Mackiewicz: ZPL is the leading Polish organization in Lithuania – it involves socially active Poles living from Klaipėda to Livonia. I don’t think of ZPL as a solely sponsoring and supporting organization. The very existence of the Association and the act of uniting active people is very important, as much as the awareness of one’s reasons, maintaining historical memory, and documentation of Polish tracks in those territories. Indeed, Poles have done great things for Lithuania. The ZPL Executive Board has its headquarters in Vilnius; branches of the association function in the Kaunas Region, Žemaitija, Livonia, and, of course, in the Vilnius region. We can take care of sponsorship, support, and assistance together. If need be, we are able to stand shoulder to shoulder with each other and say what we do not approve of. The international community has developed standards for protection of national minorities. When it comes to the inner life of a particular ethnic group, it is the group that should decide. It is unacceptable when fellow citizens constituting the majority try to impose something on this group. In the areas where the branches and clubs of ZPL function but where there are no Polish schools, we try to organize the activity of Saturday-Sunday schools. They’ve worked as part of ZPL for years. We try to satisfy the most urgent needs of studying in and teaching Polish, take care of students (who amount to 300 in all), organize trips to Poland for them and the like. I’d like to thank those strong women, who work in those schools on a sometimes voluntary basis, preserve the Polishness, teach the Polish language, culture, literature, Polish traditions. There are a lot of people willing to learn the Polish language and culture, but there are problems with the lack of teaching staff. And so we’re still seeking solutions and implementing new ideas. L24: This year Poles organized a series of protests, thus expressing their disapproval of the authorities and their handling of the Polish education field in Lithuania. Postulates of parents and children who attend Polish schools were approved by ZPL as well. It’s a specific proof of Polish community unity, isn’t it? These days we face the next depletion of possessions of the Polish community in Lithuania. Obstacles are still being created for the Polish school. High school accreditation is the next major blow. In the local governments where AWPL rules, those problems don’t exist. But what can we observe in Vilnius? One school gains accreditation and “high school” status easily, another one meets with a refusal to be granted this. I think that a good Polish school should function in every Vilnius district. There are more Poles living in the capital district, Fabijoniškės, than there are Lithuanians in the whole of Poland. Lithuanians have their schools in Poland; they have their needs and we approve their aims. What does Fabijoniškės have instead? Well, nothing. Polish children have to commute to schools that are far away from their homes. Ruling bodies in Vilnius want to deprive the Antakalnis district of a Polish school. The students from that district are supposed to seek a school somewhere else, in other words, to put up with a lengthy commute. It’s obvious that these are deliberate impediments. We Poles, as taxpayers, give money to maintain schools, just like other citizens – so those are our schools too. We can’t allow the decision-makers to close schools and dictate terms which are unacceptable for us, and all this while still taking our money. Polish schools were here in the past – and they still have a right to be here. Wise authorities would let them function in every district of the city. Polish schools are good schools! Let’s look at it objectively: in comparison with Lithuanian and other schools Polish schools have really impressive achievements – not only when it comes to teaching, but also educational processes. In Polish schools the range of extracurricular activities offered is varied and remarkably rich. We can find here, for example, artistic activities. How many students have been part of “Wilenka” [Song and Dance Ensemble; translator’s note], which have functioned for more than 40 years now in the Władysław Syrokomla High School in Vilnius. Now those people perform with other groups, keep on spreading our Polish culture. It’s just one of many examples that can be quoted here. There are lots of contests, meetings, social evenings, and foreign trips organized by our schools. The cultural and educational life is in full swing. The achievements of a Polish school in these fields are considerably greater than those that can be found in many other schools, including Lithuanian schools. I’ll give you another example. Let us consider students who attend joint Polish and Lithuanian schools/academies. They often feel a longing for the Polish environment, for social and artistic activity. They join the clubs of the Association, participate in its events, go to work in Zułowo [Józef Piłsudski’s birthplace; editorial note]. They feel the need to keep in touch with each other, as this need of social activity for the benefit of the community has been instilled in them. I’ve never heard of any drugs-related problems occurring in any of the Polish schools while other schools experience serious drugs issues. Polish schools tend to protect the children from negative influences in society. L24: Basically, you answered our next question. There is much discussion on the problems with which Polish educational institutions in Lithuania have to deal. We may have an impression that the only thing a Polish school is occupied with is the struggle for survival, but the Polish education field has a lot of successes on its account and it is oriented towards development and progress. What do you think about this? Michał Mackiewicz: Committed teachers work in our Polish schools. But an unsound theory has arisen, and the authorities want to nominate Lithuanians for the positions of the headmasters of Polish schools. They justify this by saying that school community integration will proceed from there more effectively. It’s blatant mockery. Those who invented this justification, however, treat it seriously – and this is dangerous. Speaking of integration, I’d like to point out that, for some time, I’ve thought of organizing a concert during which Polish folk ensembles would sing in Lithuanian and perform Lithuanian dances. Almost every Polish group from Lithuania also performs abroad. Lithuanian emigration groups in the USA and Australia have attended the concerts of a Polish folk ensemble “Wileńszczyzna” [trans. “Vilnius region”], conducted by Gabriel Jan Mincevič. It is a celebration for them, as they have a chance to listen to Lithuanian compositions as well. It proves that the Poles are not just loyal citizens, but that they also love Lithuania, although sometimes it is not a mother for them, but a stepmother. Yet every Polish folk ensemble in Lithuania also has a beautiful Lithuanian repertoire. And the performance level of Lithuanian compositions given by our groups is very high. What’s important is that they should reach a wider audience and help prove that we are not enemies of Lithuania, that we’re the same – just a little bit different because of our Polishness. I think that concerts by the Polish groups performing Lithuanian compositions will allow Lithuanians to know us better. But it doesn’t mean that such a Polish group will become Lithuanian – it would be the process of “un-Polonisation” of a Pole, the so-called “integration” into society, giving a warped meaning to the word. We do not agree with it. But, in order to like others, first of all it’s necessary to get to know them and learn about their culture. L24: Education is an important part of your activity as a Seimas member. What does the defence of postulates that are important for the survival of Polish schools look like in the Lithuanian parliament? What attitude prevails among Lithuanian deputies when it comes to Polish educational postulates? Michał Mackiewicz: From the perspective of these years in the parliament I can say that the Lithuanian deputies, from the right to the left wing, have a negative attitude towards our postulates. Some of them can’t be persuaded in any way, some of the others supposedly approve our postulates, but when there’s a vote they stand against us as well. 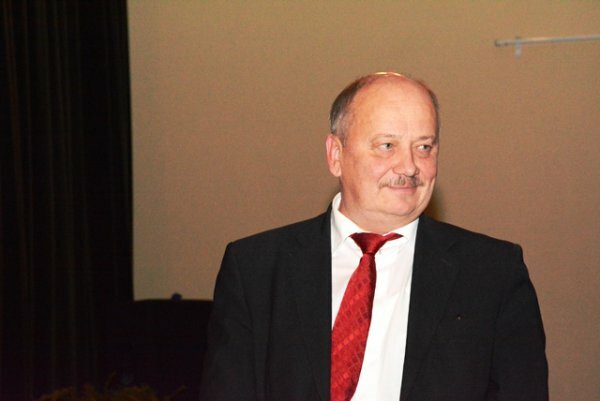 While clinching issues important for Poles in the parliament, there are always some nationalists like Garšva [Kazimieras Garšva – the leader of the nationalistic “Vilnija” organisation; editorial note] present in the Parliament Hall, who sit, watch carefully, elucidate the result of the vote to the media. If any of the Lithuanian parliamentarians approve adjustments that are favourable for national minorities, the hecklers start screaming and calling them traitors of the nation. Then those who vote start to think this way: your Europe is far away, and I must come back to my Skuodas [a city located in Klaipeda County, Lithuania; editorial note], in addition the media will announce that I’ve betrayed Lithuania for the benefit of a few Poles. The deputies can see that we’re normal people with whom you can talk. Work is performed in committees but also behind the scenes. We talk a lot, debunk lies and stereotypes. Our presence in the parliament is necessary because we also frequently prevent certain events. For example, a deputy from Skuodas, who at the beginning of his tenure believed what nationalists write in the media about Poles and judged us skeptically. Only now does he have a diametrically opposite opinion on Poles. Why? Because he has got to know us. Perceptions and stereotypes about somebody who is unknown to you and with whom you haven’t had a chance to meet are the worst. L24: I’d like to ask you for a few words. What would you like to say to the community of Polish schools in Lithuania? It can be advice, a wish, or a message for today. Michał Mackiewicz: Christmas is coming, so I would like to wish everyone Merry Christmas, believing that everything will be all right. Faith is the most important thing. Polish schools have been here for centuries and will not disappear, because they cannot disappear, just as Poles cannot disappear. Indeed, the spirits of our great ancestors, great Vilnians, watch over us. These spirits are of those who lived for this city and formed it, leaving it to new generations as an inheritance. Everything will be all right. L24: Thank you for the interview.